Wandering through Pittsburgh’s Strip District, there are many lures – clothing, collectibles, souvenirs, home decor and plenty of tasty treats. But I spent a lot of time looking at this mural, painted on the side of a building in the middle of the district. 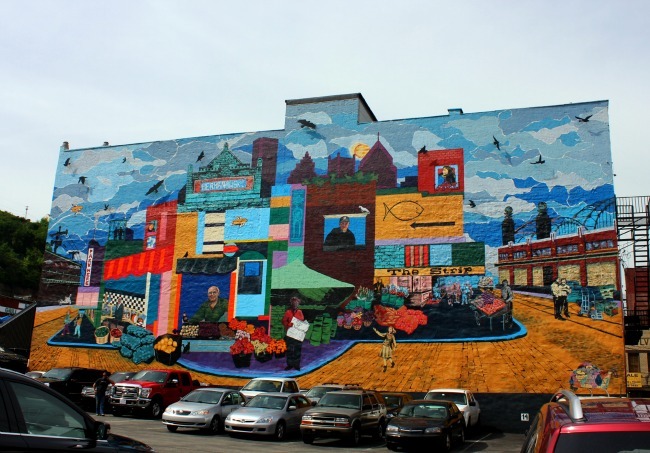 This mural tells a story – not just of the city of Pittsburgh, but one of its unique neighbourhoods. The Strip District may be a lure for visitors, but its definitely an area that is populated by many locals, especially on weekends. Bold colours were the first thing to capture my eye – then it was the linear shapes of the buildings, colour-blocked to emphasize the connection of the neighbourhood. I liked the inclusion of the bridges in the distance, a hallmark of this city and the occasional faces of locals – not knowing the city, I’m not sure if they’re actual citizens or composites of those who work in the Strip District. The simplicity of the images highlighted their importance – the fish, vegetables and flowers were all welcoming signs to shoppers. Having an artist interpret the neighbourhood within the neighbourhood may seem odd to some, but to me its a welcome sign – of all that can be found within the borders of this area. As many cities reclaim their traditional market areas, or celebrate them with the ongoing trend to eat local, I’m happy to see any city that makes a point to show off its marketplace – an area where commerce and community are entertwined. Most of the people in the mural do represent business owners or residents in the Strip. There are also lots of little clues and icons representing things about the Strip, like the flying biscotti in the sky (representing Enrico Biscotti). Glad you like the mural – the Strip community did a lot of work with the artists over two years to get to this final iteration of the mural.